“We had to wait for the first Latin American pope to beatify Oscar Romero." That’s how Archbishop Vincenzo Paglia described the long wait for the Vatican’s green light for the beatification of the Salvadoran archbishop. "There's a connection between the pontificate of Pope Francis and the beatification of Romero, which I would sum up in the phrase: 'a church that is poor and for the poor,'" Archbishop Paglia said, citing Francis' remark shortly after his election in 2013. Archbishop Romero, an outspoken defender of the poor and a critic of human rights abuses, was murdered in 1980. Archbishop Paglia, the postulator for Romero’s sainthood cause, spoke at a Vatican press conference Wednesday. He said Romero is expected to be beatified in San Salvador sometime later this year -- the earlier the better. Pope Francis’ decision to approve the martyrdom of Archbishop Romero, announced Tuesday, fit well with the Argentinian pope’s vision of the church’s place in society, the role of the bishop and the process by which sainthood is recognized. It also underscores some similarities and a few important differences with his two predecessors, Benedict XVI and John Paul II. Re-reading some of Romero’s writings and homilies, one immediately senses an affinity with Pope Francis’ emphasis on a church that is close to the people, especially the poor, and that is not afraid to be socially and politically involved. As it happens, Pope Francis was quoting Pope Benedict in that particular passage. Pope Benedict once said Romero deserved beatification, and Pope John Paul II once prayed at Romero’s tomb. But both Benedict and John Paul II were hesitant to promote his sainthood cause. Pope Benedict feared that a “Saint Romero” would be politically manipulated in Latin America, and one presumes John Paul II had the same apprehensions. On the other hand, according to Paglia it was Benedict who unblocked Romero’s cause late in 2012, little more than a month before the German pope resigned. 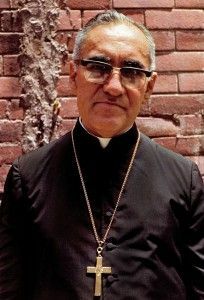 Over the years, Archbishop Paglia recounted, strong opposition was expressed to Romero's beatification. A "mountain" of paper arrived in Rome with objections, including accusations of doctrinal errors that needed to be investigated by the doctrinal congregation. The strongest objections were that Archbishop Romero was too political. Pope Francis does not appear to be intimidated by political fallout when it comes to such causes. I think that’s because he expects the church to be deeply involved in the lives of the people, even if that creates waves and provokes criticism – or, as he said famously in Brazil, “a mess.” He also wants bishops to be closer to their flocks, sharing their suffering. It was interesting that on the same day he approved Romero’s beatification, Pope Francis also signed off on the martyrdom of three priests killed by the leftist guerrillas in Peru in 1991. It was as if to say that “hatred of the faith” can come from anywhere along the ideological spectrum. Francis has spoken of the price Christians must sometimes pay for witnessing the faith. “The disciple is ready to put his or her whole life on the line, even to accepting martyrdom, in bearing witness to Jesus Christ, yet the goal is not to make enemies but to see God’s word accepted and its capacity for liberation and renewal revealed,” the pope said in Evangelii Gaudium. In general, Pope Francis seems to have an implicit trust in Catholics to recognize saints, relying less on Roman procedures to verify a life of holiness or martyrdom. He has several times waived the miracle requirement for canonization. In that sense, I think the strong conviction among many Latin American Catholics that Archbishop Romero was a saint helped move his cause forward once Francis assumed the papacy.